Sorry that I haven't kept up with the blog like I had in the past. We have been busy at home in the evenings and on the weekends. I haven't gotten any sewing done since getting home from Paducah, and to be honest, didn't do much before I left for Paducah! My new passion seems to be painting on flower pots and planting flowers. I do have to get busy on Nick and Olivia's wedding quilt. Their wedding is in August and all I have done is pick out fabrics and a pattern so far. We did end up with a new purchase. Well, not really new, but new to us. 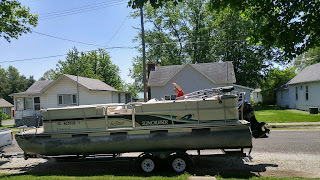 We bought a boat! 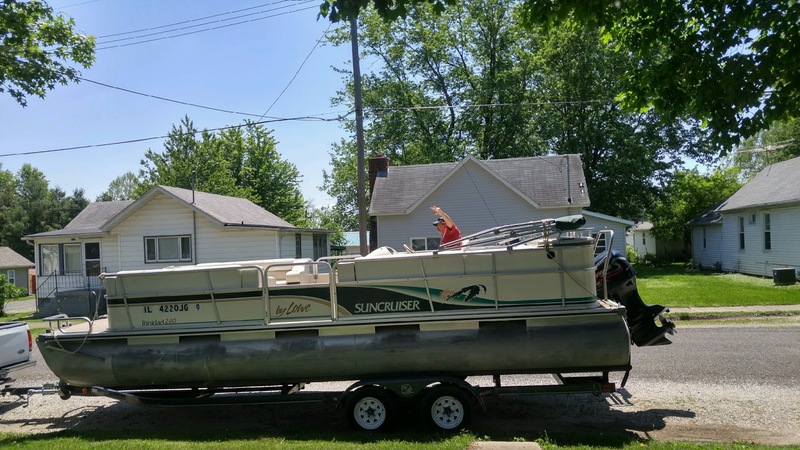 It's a 24' pontoon boat with a 115hp engine. It's a 1999 model, but was kept in pristine condition. Ev is over the moon about it. We have not gotten it out on the water yet. Just picked it up over the weekend. The gentleman that we bought it from is a neighbor of Ben and Johanna's. Nice guy. His wife passed away and he is selling a few things. We were very fortunate to get it at a great price.